Apple isn’t bragging on its iOS 8 adoption numbers like it has in years past because it appears uptake has been slightly slower. The reason? The much bigger iOS 8 download doesn’t fit on many people’s devices which are often stuffed to capacity with music, movies, photos and apps. Apple’s latest numbers are for Sunday September 21, 2014 and show that from people who visited the App Store on their iOS device, 46% were already on the new iOS 8. On one hand this number is skewed higher because most of the early adopter nature of frequent App Store visitors but on the other hand many people visit the App Store from older devices that can’t be updated to iOS 8. Apple’s own numbers show something else slightly troubling. 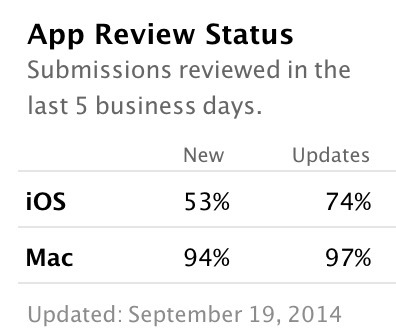 App Store app submissions are being delayed slightly as of iOS 8 launch with only 74% of app updates and 53% of new apps being reviewed. Apple is usually in the high 90% range on iOS as it is with Mac.